Welcome to Fredericton Pony Club! 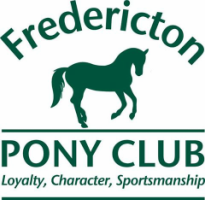 Fredericton Pony Club is a small branch of the Canadian Pony Club. We are dedicated to education, safety and the love of all things related to equestrian sport and leisure. Pony Club is an international, voluntary, non-profit organization for young people interested in horses, ponies and riding. It is the largest association of riders in the world with more than 100,000 members in over 20 countries, including Canada. We are proud of our Canadian Pony Club members who learn to be responsible, confident, motivated horse people, with a high degree of knowledge and skill in equestrian arts. Riders have an opportunity to learn leadership and teamwork and make many new friends. Every Pony Club branch is unique and offers activities based on their facility, volunteers and interest. Fredericton Pony Club focuses primarily on horse care, safety, education and social activities. Riding opportunities (and lessons) are available, however, this is not the primary focus of our weekly "Sunday afternoon" activities. Please inquire for more details. Pony Club isn't just about riding a horse or pony - it's a program designed to help kids learn everything there is to know about these animals...it's giving them the opportunity to try different disciplines of the sport (show-jumping, dressage, eventing, tetrathalon, etc.) and most importantly, providing them with connections to other kids in their town, province and region who share this passion. Pony Clubbers make lifetime friendships in a club designed for horse-crazy kids! You don't have to own a horse or pony to join Pony Club - you don't even have to be taking riding lessons - you just have to have an interest in horses! Many people wonder if they have to move their horse or pony (if they have one) to a "Pony Club barn" in order to be a member - not at all! Pony Clubbers can ride wherever they want, with whatever coach they want - in fact, Pony Club District Commissioners are a great resource to find out where to go for riding lessons, to find a stall for your horse or pony, etc. - we aim to help you find the best care and coaching. Our education program is recognized world-wide. The Equine Canada Rider Levels are based on the Pony Club education program. You can do BOTH Pony Club and EC Rider Levels, you don't have to choose one or the other! Please visit our ACTIVITIES page to see the kinds of activities (both social and educational) that we do with our members - the sky is the limit!